Elvis Today: "Everyone Does Enjoy Hearing You Sing"
As Elvis would've been 76 years old today, I had planned to write something about how he celebrated his birthdays through the years. But that plan had to be abandoned as I noticed that Alan Hanson over at the Elvis History Blog had done just that. Now I know how Troy Y. felt must've felt when he was to write his Christmas edition of The Mystery Train Elvis Blog. Alan Hanson took a look at what Elvis was doing on the 23 birthdays he celebrated during his career. Thankfully for me he didn't mention how Elvis celebrated his birthdays before becoming famous, so I thought I'd mention one that was particular important, and took place exactly 65 years ago today. On Elvis' eleventh birthday, January 8, 1946, his parents bought him a guitar at the Tupelo Hardware Store. According to Pter Guralnick in his book Last Train to Memphis Elvis wanted a bicycle, but his mother Gladys was worried he'd get hurt. That the guitar was considerably less expensive had something to do with it, as well. 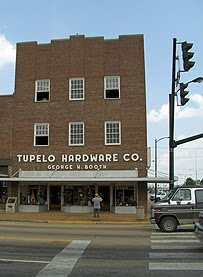 In fact, I visited the Tupelo Hardware Store in August 2005, while attending Elvis Week. There the owner told a different story, one that was also described on a plaque placed to the left of the entrance. According to it, Gladys brought him there to buy a bicycle. Once they arrived a 22-caliber rifle caught Elvis' eye, and he asked his mother to buy it instead. She wasn't happy about purchasing a gun so they compromised on a guitar. Wherever lies the truth, it was a special feeling entering that store and standing at the counter where once Elvis had stood. And I love the words Gladys is supposed to have said to Elvis right there, according to Peter Guralnick: "Son, wouldn't you rather have the guitar? It would help you with your singing, and everyone does enjoy hearing you sing,"
They still do, 65 years later. Happy birthday, Elvis!